When I became a mom my meditation practice was gone. Before, I had a 20-minute a day practice. Now and I didn’t even have 5 minutes to take a shower. But I needed help finding my best self more than ever. I was exhausted, depleted, stressed out, easily annoyed, and just focused on making sure my baby was as happy as possible. I had forgotten to take care of myself. I decided to try and pare down meditation into simple steps that I – or any busy mama – could choose from each day, depending on the time and what I was feeling. 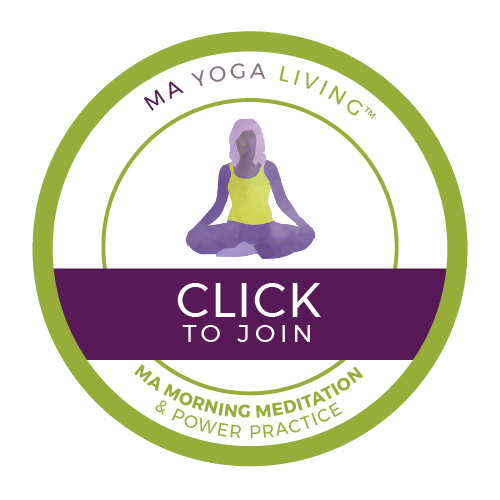 Whether you’ve never meditated before or you have a strong mantra practice, the Ma Meditation and Power Practice will help you have a comprehensive practice that shifts your energy into possibility – without taking a lot of time. I took the program because I have been trying to deepen my commitment to meditation/expand my meditation practice. I am a stay-at-home mom to a five year old and a two year old, so this seemed very fitting. And also realistic in terms of my schedule! I loved that it was broken down into small sections, and that it was a combination of videos, reading material and assignments. I printed out a few of the PDFs and keep them in my meditation spot. I really enjoyed the guided meditation about stepping out of the river. I think the program really helped me accomplish my goal! I love that you provided encouragement to meditate regularly even if it’s only for a short time. And you provided structure for short meditation sessions. This is hard to find! I find myself meditation for a minute sometimes and just doing deep breathing much more often then I used to, even when I don’t have time for longer sessions. Also I’m very list-oriented so I loved how the program listed the steps and then checked them off as you completed them. Very encouraging. Thanks so much for developing this program and making it accessible online! I loved that it was so specifically tailored to the needs of pregnant women and moms. It was immensely helpful and reassuring to me. To be honest, I forget how I even heard about the program. Obviously a gift from the universe! In this section, we will discover how to breathe in a way that nourishes us (and baby if baby’s inside). When we lengthen the exhale and expand certain areas of the body, we send a message to the nervous system that everything is ok. Our parasympathetic nervous system kicks in, slowing down heart rate and lowering blood pressure. It also creates a vacuum for a naturally fuller inhale to feed every cell with oxygen and prana (the invisible forces that nurture the physical body). We also want to breathe using our stomach muscles optimally, so we are not creating pressure outward which can cause diastasis recti and weak abdominal muscles. When we breathe fully and consciously we feel at ease, connected, and grounded. Meditation doesn’t mean stopping the thoughts – the mind will do it’s job no matter what. It means remembering that we are free to choose where to place our attention and understanding that whatever we focus on, grows. In this section we receive tools – mantras – and learn how to use them to help us gently bring our attention back to the present. You can choose from the pdf list or learn to make up your own. You will find there are moments where we no longer need tools, and just on our own we find ourselves in our peaceful, blissful center. We are learning to be more present for what really matters in life, rather than missing moments worrying about the future or regretting the past. From the quiet space you’ve invited inside, and you begin to be more familiar with your deepest longings. This part of the practice helps us identify and begin to manifest all that we desire. This is a magical step that is wonderful to share with children! We often make discoveries in our meditation practice that help us understand our lives better, and help us know what to do next. In this section we’ll make sure to harvest all the good stuff from our practice so we continue to become the divine Ma goddess we are inside! Early on I shared my practice with my little one. She would sit on my lap and breathe into my chest… we would set our intentions together for the day and it helped her learn how much power she has to choose her experience. Now, she won’t start reading before bed without doing our gratitude practice together. And while she doesn’t have a consistent meditation practice, she knows the power she has to change her mood and her energy. Of all the health and wellness routines I teach – or “Anchor Practices” – I believe meditation is the most important. It sets us on a path of listening to our inner wisdom throughout our day, so we can make better choices for ourselves. As busy moms it’s crucial to have this as part of our routine, just like taking a shower. Not because we can do it every day – but because we notice when we don’t, and we know how to get back on top of our game. The earlier you start having a practice, the easier it will be to fall back on it when things get tough. So if you’re pregnant, the pregnancy affirmations will get you on your path and help you feel confident as labor approaches. From stress to anxiety to postpartum depression to hormonal imbalance and overwhelming emotions, meditation helps us handle all of it more easily. You have an inner wellspring of nurturing energy, and you can learn to tap into it. This gives you MORE energy, and you’ll feel like you have MORE time than ever. Register for the Ma Meditation & Power Program for only $75! $67.50 with Ma Yoga Mamas members get 10% of with discount code. 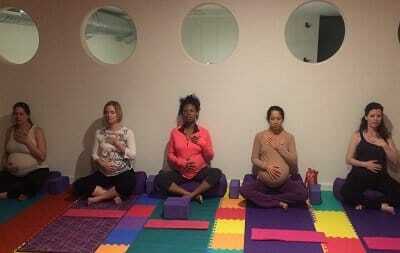 Sign up now for the Ma Meditation & Power Program for Busy Mamas! Join the email list for Ma Meditation & you'll get the course outline, tips and more!